Last year I was lucky enough to be awarded an RPS Composition Prize. 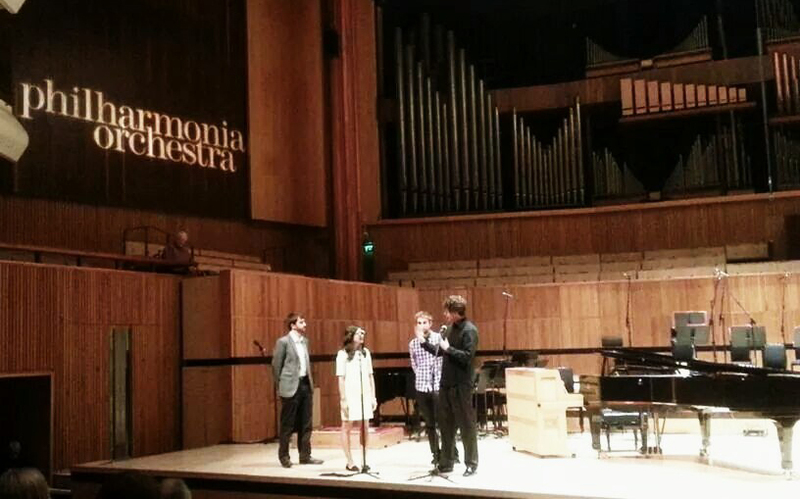 As part of the prize, I was commissioned to write for the Philharmonia Orchestra. Over the course of nine months I worked on this commission with mentoring from Unsuk Chin. Working with both the orchestra and Unsuk was a very positive experience and I am so glad to have had this opportunity. The final piece, Sense of Place, was performed alongside pieces by Matthew Kaner and Michael Cutting at the Royal Festival Hall on 31st May 2014, conducted by Clark Rundell. The commission was for a ten minute work for the following instruments: Flute, oboe, clarinet, bassoon, horn, trumpet, trombone, 2 percussionists and piano. I used all of the instruments listed, plus the flute doubles on alto flute. The percussion I chose was as follows: Tuned gongs, tam-tam, suspended cymbal, marimba, vibraphone, crotales, snare drum & bass drum. Whilst working on our commissions, we had access to the players of the orchestra, conducted by Mark Heron, for a preliminary rehearsal where we could try out some of our ideas during the early stages of the project. I produced two sketches of material I wanted to try out in this workshop. One of these two made it into the final piece – a solo for alto flute accompanied by marimba. I dislike workshops as an end in themselves but as part of a work-in-progress they are extremely useful. It provides an opportunity to take risks and try out ideas before committing them to the final piece. One of the inspirations behind Sense of Place was Italo Calvino’s novel Invisible Cities. Invisible Cities acts as a ‘centre and absence’ in Sense of Place; whilst the novel was integral in the construction of the musical work, without prior knowledge the audience would not be able to discern its presence in performance, given this is an instrumental work and none of the text is presented. My aim was not to attempt to tell the story of Invisible Cities, rather I took the aspects of the novel which made the most striking impression upon me and found musical parallels for my own work. The structure, harmony, rhythm and atmosphere of Sense of Place were deeply influenced by the novel and therefore it is at the heart of the composition. The experience of reading Invisible Cities had a profound effect on me and creating this piece provided a way to possess the novel and respond to it artistically. Another significant influence on the piece was an exhibition at the Royal Academy of Arts this spring, Sensing Spaces: Architecture Reimagined. Seven architects from around the world were commissioned to create immersive installations for spaces in and around the Royal Academy. These installations explored ‘the impact of built space on our lived experience’, encouraging the public to think about how we react to built spaces, how they make us feel and what they provide beyond the purely functional. As I walked around the Royal Academy, I was acutely aware of how the spaces had been shaped and the impact this had on my experience. This had a lasting effect and I continue to feel this heightened sense of awareness for the spaces in which I inhabit day-to-day, both physically and emotionally. The emotional response is a reaction to the aura of a place but this aura is both immediate and at a remove. It feels close due to the immediacy of our response but it is also beyond our grasp because it is not tangible. It is this response that prompted the title of this piece. Experiencing the aura of a place requires all our senses and in complex combination; we know a city not just by sight but with all our senses and through our interactions with it. Calvino encapsulates this multifarious relationship between man and the metropolis within the pages of Invisible Cities. Sense of Place has the Calvino at its heart, both in terms of its structural features and the musical content itself. Through this piece, my own kaleidoscopic relationship with the city is evoked. written. As well as this, it is the time when control of the music is handed from the composer to the musicians; there are opportunities to comment in rehearsal but ultimately it is up to the conductor and the players to interpret what I have put on the page. After the first rehearsal there was just one more at the Festival Hall on the day of the concert. The first rehearsal is always quite an overwhelming experience and while the players were brilliant I struggled to feel confident about how it would ‘breathe’ in the Festival Hall. The rehearsal space was far smaller and it was difficult to tell whether I had judged the balance and pacing of events correctly. Clark understood the nerves that come with the first rehearsal and was very reassuring throughout. My worries were assuaged at the second and last rehearsal. Hearing the piece in the Festival Hall made all the difference. Suddenly everything sat a lot better, in terms of balance and atmosphere. As a composer I cannot control the reactions of the audience but I can try to write a piece that I feel expresses what I want to say. The concert itself was a really lovely occasion and working with Clark, Unsuk and the Philharmonia was a great experience from start to finish. The pieces written by myself, Michael and Matthew were very diverse in style and this made for an interesting concert programme. Hearing their music and watching their rehearsals was as much of a learning experience as working on my own piece. A phrase coined by Boulez in relation to his use of Mallarmé’s poetry in Pli selon pli. Extract for the text on the cover of Sensing Spaces, the book which accompanies the exhibition, Royal Academy Publications, 2014.